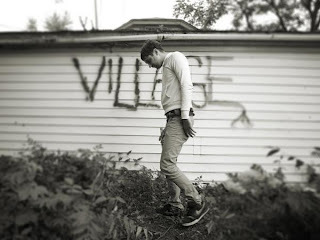 Ex-Living Blue frontman Stephen Ucherek's new project, Village, has already produced some good material, as evinced by his solo set last Wednesday at Schubas. The new sound carries the psychedelic sound of The Living Blue's most recent album, Walk Talk Rhythm Roam, a bit farther, featuring reverb-heavy vocals and jangly guitar strum-riffs. Although there were definitely moments during the set that could have benefited from a full musical outfit, Ucherek's hypnotic solo appearance as Village was surprisingly rich. Another promising new addition to Chicago's local music scene comes from Old Fake, whose live sound combined 60s pop songwriting forms with the bombastic flair of garage blues-rock. The set was loud and got the hump-day audience up on their feet and moving to the music. Philadelphia's Free Energy had some tough acts to follow Wednesday night, and although the ex-Hockey Night band members looked like the most egregious victims of hipster fashion when they took the stage, they at least played an enjoyable set of 70s-inspired glam/prog rock. Highlights of their live set included the bell-like clarity of the frontman's vocals, sparkling guitar fills, and a downright bizarre Q-and-A session between the audience and the band while their bassist replaced a broken string in order to finish the set. It was worth sticking around for. Old Fake will be playing Sunday, September 20 with Wavves and Ganglians at The Empty Bottle. Village will be playing downstate in Champaign-Urbana Friday, September 18 as part of the Pygmalion Music Festival. This article also appears on Chicago Indie Rock Music Examiner.